This story follows the lives and careers of two early black female physicians after their graduation from the Woman's Medical College of Pennsylvania in 1897. Students can explore and do some historical detective work with these sources to learn about how widely the two women's paths diverged in their medical careers. This line of inquiry may be integrated into a lesson or unit on or act as a prompt for further student research into facets of the African American experience at the turn of the century. Analyze the language, content, and tone of the news clipping "Coal Black Woman Doctor." What details does it reveal about the culture it was written in? Circle or underline the words, phrases, or sentences that back up your claim. Using the first half of Dr. Grier's letter to Susan B. Anthony to the first paragraph of Dr. Evans' letter to Alfred Jones, list as many details about the author's life and work that you learn from reading each letter. Use the two lists to compare the experiences of Dr. Grier and Dr. Evans as working women physicians. Imagine Dr. Evans in 1907 and Dr. Grier in 1901 ran into each other. In catching up, what would they have to say to each other about their practices, the obstacles they face, and their goals for the future? Would they have positive or negative memories of their time at Woman's Medical College? Write the dialogue of a conversation between the two women that answers those questions. What personas do Dr. Grier and Dr. Evans present in their letters? Cite specific language in the text that contributes to that persona. Do you think that the Women's Medical College was a welcoming place for Grier and Evans? Was Dr. Grier "successful"? As a physician? As an emancipated slave? 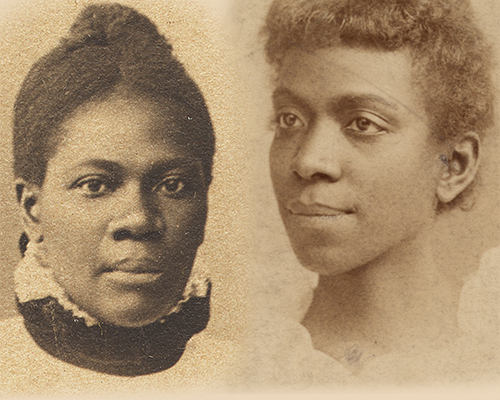 How were Eliza Grier and Matilda Evans' lives and career paths reflective of the overall African American experience during this time? How were they exceptional? How has your race, gender, and economic status affected your education? "Speech to the Atlanta Cotton States and International Exposition." Booker T. Washington. Atlanta, GA, September 18, 1895. Washington's speech illustrates one end of the spectrum of perspectives on the best path for achieving racial equality in the United States. Washington won the favor of many white Southerners by advocating for black Americans to take "common labor" jobs, like those in agriculture and domestic service, that were lower on the social ladder. "Of Mr. Booker T. Washington and Others." W.E.B. Du Bois, in The Souls of Black Folk. New York: Bantam Classic, 1903. Du Bois placed himself on the opposite end from Washington on the of the spectrum of views on the path forward for black people in the United States. His views emphasized the higher education of black youths, and the destruction of the racialized barriers to entry into professions in politics, academia, and medicine– barriers that women like Evans and Grier ran up against throughout their careers. "'Somewhere' in the Nadir of African American History, 1890-1920" Glenda Elizabeth Gilmore. Freedom’s Story, TeacherServe. National Humanities Center. Accessed 2/2/2018. Essay on approaches to teaching and guiding student discussion on this period in African American history.